Before 1781: he started his career as a disciple of Takemoto Saburobê II and worked as a sakusha for the puppet theater. Then, he joined the Kabuki world. 11th lunar month of 1781: Saburobê worked in Kyôto, along with Tatsuoka Mansaku and Haruki Motosuke , on the kaomise drama "Shin Yakata Fukki no Ishizue", which celebrated the shûmei of Yamamoto Giemon and Hanagiri Tomimatsu I and welcomed back in Kyôto the star Nakamura Tomijûrô I. 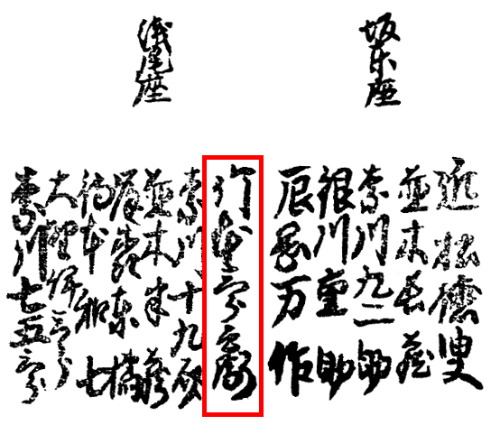 12th lunar month of 1783: Saburobê worked in Kyôto, along with Tatsuoka Mansaku and Tsutsui Sanchô, on the kaomise drama "Sanjikkoku Yofune no Hajimari". 11th lunar month of 1784: Saburobê worked in Ôsaka at the Naka no Shibai, along with Nagawa Shimesuke I, Toyotake Ôritsu and Nagawa Eichôdô, on the kaomise drama "Naka ni Môketa Otogo Kaomise", which welcomed in Ôsaka the Edo stars Matsumoto Kôshirô IV and Iwai Hanshirô IV. 11th lunar month of 1785: Saburobê worked in Kyôto, along with Tatsuoka Mansaku, on the kaomise drama "Hôjô Jiraiki". 11th lunar month of 1786: Saburobê worked in Kyôto, along with Tatsuoka Mansaku, on the kaomise drama "Shinchoku Niai no Enmusubi", which was produced by Sawamura Motosaburô and celebrated the shûmei of Yamamura Tomoemon I. 11th lunar month of 1787: Saburobê worked in Ôsaka at the Naka no Shibai, along with Chikamatsu Tokusô , on the kaomise drama "Masaru Medetaki Toshi no Kaomise", which was produced by Nakayama Fukuzô. 11th lunar month of 1788: Saburobê worked in Kyôto at the Nishi no Shibai, along with Shimada Kôzô , on the kaomise drama "Tokiwa Ichô Genji no Kaomise". 11th lunar month of 1789: Saburobê worked with Namiki Gohei I at the Kado no Shibai on the kaomise drama "Kaomise Chigusa Musubi". 11th lunar month of 1790: Saburobê worked with Chikamatsu Tokusô at the Naka no Shibai on the kaomise drama "Taiheiki Chûshin Kôshaku". 12th lunar month of 1790: Saburobê worked in the same theater on the drama "Kinmon Gosan no Kiri", which starred Kanô Hinasuke I in the role of Ishikawa Goemon. 11th lunar month of 1791: Saburobê worked with Nagawa Shimesuke I at the Kado no Shibai on the kaomise drama "Keisei Shinobazu-ga-Ike", which was produced by Asao Okujirô I. 12th lunar month of 1791: Saburobê worked in the same theater on the drama "Hade Kurabe Ise Monogatari". 11th lunar month of 1792: Saburobê worked with Nagawa Shimesuke I and Nagawa Tokusuke at the Kado no Shibai on the kaomise drama "Hito no Kokoro-ni Kanô Kaomise", which was produced by Asao Okujirô I. He also worked in the same theater on the drama "Gion Sairei Shinkôki", which starred Kanô Hinasuke I (Yamaguchi Kurojirô, Matsunaga Daizen), Ichikawa Danzô IV (Oda Nobunaga, Konoshita Tôkichi), Nakayama Raisuke II (Kanônosuke Naonobu, Shinsaku), Nakamura Noshio II (Princess Yuki, Kichô-no-Mae) and Asao Tamejûrô I (Konishi Zesai). End of 1793 ~ beginning of 1794: Saburobê worked in Kyôto. End of 1794 ~ beginning of 1795: Saburobê worked along with Nagawa Kunisuke in Ôsaka in miyaji shibai, at the Amidain Monzen-mae Shibai. No record afterwards. Takemoto Saburobê III was a Kamigata sakusha, who was active in Kyôto and Ôsaka from the first half of the 1780s to the middle of the 1790s. The others sakusha were Amano Shôzô, Tatsuoka Manji and Nakamura Kasuke. The others sakusha were Nakagawa Shôgorô, Namiki Hanzô, and Matsukawa Sada. The others sakusha were Ono Isaburô and Matsumoto Washichi.